(Taipei, Taiwan - April 2018) Advantech, a global leader in intelligent systems, is announcing the release of two new models in the company’s WISE-4000 wireless sensor node series: the WISE-4220 Wi-Fi IoT wireless sensor node and the WISE-4470 3G IoT wireless sensor node. With industries placing greater emphasis on big data, artificial intelligence, and machine-learning applications, all of which rely on continuous data transmission from field site equipment to cloud platforms, these two units are based on micro-electro-mechanical systems (MEMS) and microcontroller (MCU) technology with built-in encryption provided by STMicroelectronics (ST). In addition to enabling the collection of large amounts of data in real time by utilizing the high bandwidth of IP-based network communications, these two products can support multiple IoT communication protocols, such as MQTT, RESTful, and CoAP. Data can be transmitted directly from equipment sensors to the cloud, and with a streamlined architecture, they can significantly reduce system construction costs by linking end devices to the cloud in various IoT applications. The WISE-4220 is equipped with ST’s temperature and humidity sensor (HTS221) with Wi-Fi technology to control end devices and enable cloud connectivity. 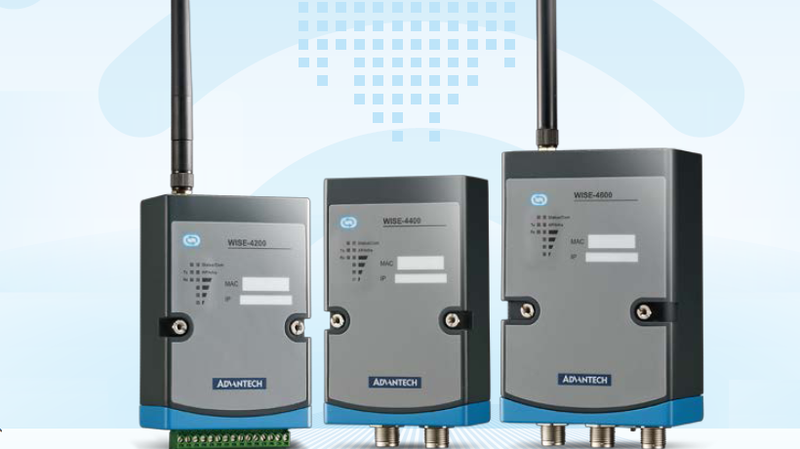 Its most significant feature is its support for MQTT, RESTful, and other IoT communication protocols, which enable the WISE-4220 to connect directly with Microsoft’s Azure IoT Hub, Advantech’s WISE-PaaS, and other cloud platforms without requiring additional gateways. The data storage design adopts an RTC time stamp that allows the unit to accumulate multiple data records and upload them to the cloud in a single transmission. This assists in reducing data traffic, maintaining network stability, and can even lower communication costs. In the event of network communication problems, the WISE-4220 can implement its break-point resume function to prevent data loss. The WISE-4470 also utilizes an STM32L4 microcontroller and can integrate various products on a mobile network. In the near future, this model will also support NB-IoT and eMTC. Similar to the WISE-4220, the WISE-4470 also supports multiple IoT protocols and it is equipped with an RTC data logger. However, the WISE-4470 also incorporates a USB interface provided by the ST microcontroller, which allows for the rapid connection of various types of wireless communication modules. Data security is guaranteed via ST’s AES encryption technology. By inheriting the direct cloud connectivity design of the WISE-4000 series, the WISE-4220 and WISE-4470 are perfectly suited for such environments as factories, server rooms, data centers, and cold chain storage facilities. These two models can also be used for monitoring equipment status in applications involving power generators, water pumps, and air conditioners, which can help lower personnel costs by eliminating the need for inspections or patrols by maintenance staff. Furthermore, these products can reduce the risks associated with exposing employees to hazardous work environments. Through integrated cloud services, big data can be used to achieve more advanced monitoring applications, including environmental condition monitoring, equipment operation status analysis, and preventive maintenance forecasting.